My husband and I are always on the look-out for good books to add to our children's library as well as for our library at church. We especially value a good, trustworthy biography written for children. 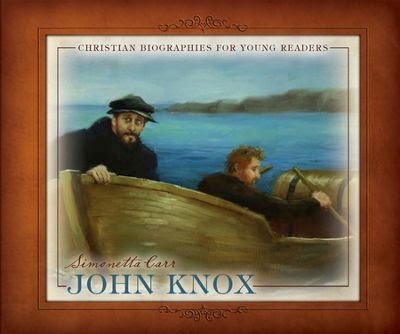 I've seen other books from the Christian Biographies for Young Readers series online, so I was excited to get my hands on a copy of this one and review it for myself. John Knox came from such quiet beginnings to lead a quite adventurous life for the sake of the gospel. He was instrumental to the rise of the Reformation in Scotland, yet many children have never heard his story. His biography is laid out with great detail and accuracy in this book, yet it's written in a way that will surely engage curious minds. The reader can follow Knox from his quiet days as a notary and tutor to being a controversial preacher whose life was sometimes in danger. The facts are laid out within the context of the cultural changes that were taking place in Scotland during this time. I appreciate that many historical images have been included in the book alongside new illustrations which will help to capture the minds of even the youngest children. While the book is engaging, it also includes great historical resources such as a time line of Knox' life and The Scot's Confession of Faith. There is also a map at the front of the book where you can follow the location of the events in Knox's life. I'm always collecting biographies to go along with the topics we study in our homeschool, and I love that this one contains so many tools that make it easy to integrate our studies. This book would be an excellent addition to any children's library, and I hope to add more books from the Christian Biographies for Young Readers series to our own.